Excellent idea to use a spiral. A very nice plan as a stand alone for sure. Thanks for sharing. I enjoyed working on this plan for my friend – particularly the Wiarton area – and felt it was worth sharing here. It’s a neat terminal, strung along the bay as it is. If I were starting the layout today, I might unfold the spiral plan and try to fit it in my layout room. But I’ll finish Port Rowan first! Love these examples of achievable layouts and prototypes. Moving up in the size of modeling scale brings a whole new set of design issues, ones that aren’t well served by the smaller scale conventional solutions. Larger modeling scales like 3/16″ and 1/4″ almost need a different design language, one that plays to the inherent strengths of these scales. Your examples are doing just that. As you know from your work in Proto:48, things like reach-in access really become major limits to the planning process in larger scales. For example, incorporating a turntable into a layout becomes a real problem in S or O – much more, it seeems, than in HO. Even in S, turntables take up so much space that putting them near the front of a scene (where I think every turntable should be, for reliability’s sake) means any track behind the table requires an unacceptable reach across the scene to uncouple cars, perform maintenance, etc… yet putting it at the rear means the turntable itself is difficult to service. On my Port Rowan layout – as on this design – I’ve addressed the problem by ensuring there’s access to both sides of the scene where the turntable is located. Beyond the practical problems, I think success comes from adjusting one’s expectations in terms of prototype. As I’m showing with Port Rowan, I’m able to model a major railroad (a transcontinental carrier, in fact), in a modest space by picking a small, out of the way community as my subject. My space could not do nearby Simcoe, Ontario justice – let alone a railroading hot spot like Bayview Junction near Hamilton. So I hope that this occasional series of thought-starting layout-planning ideas is driving home the concept of finding a piece of a prototype that’s manageable enough that it can be modelled without undue compression, so that it retains the appearance and operating potential of the prototype. I’m also a firm believer in modelling from a prototype, even if one is freelancing. Frankly, I’ve never seen a freelanced layout featuring anything like Wiarton as a branch line terminal. The thought of running a long, single track to serve multiple customers doesn’t occur to us, when we’re focused on adding switches to boost complexity and, by extension, operating “fun”. But it’s so common on real railroads, where each switch is an added cost to build and maintain, and an added source of potential derailments. Wiarton is a good example with its long tail track along the wharf, as well as the spur serving coal shed and stock pens. But one of the other popular postings on this blog – about the CNR Waterloo Sub to Galt – also features a long, single track spur (along George Street). In fact, many of the prototypes I enjoy, and try to convert to layout designs, feature a team track or other public siding as the major source of carload traffic. As I note in the Wiarton write-up, there are several industries near Wiarton’s team track that could be railroad customers – but relatively few industries actually on the railroad. I guess the oil terminal at the end of the wharf is one. The coal yard is one. 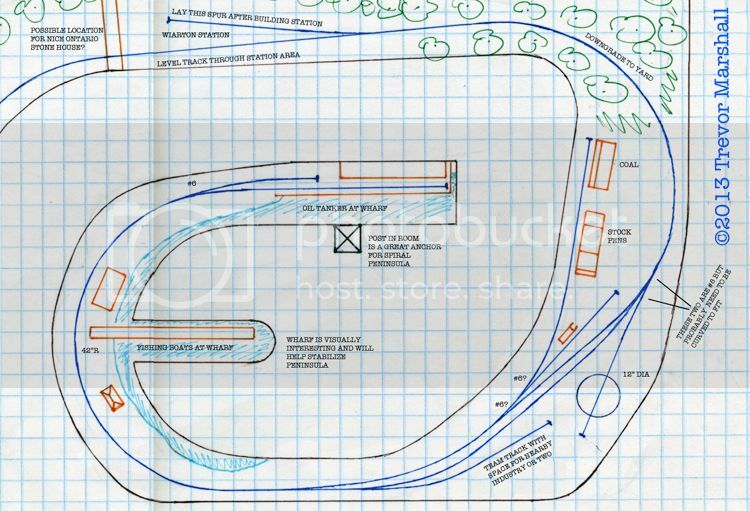 But the stock pens are probably a shared resource – more of a specialized unloading area at a team track. On the Waterloo Sub, three stations on the line are nothing more than team track spurs, while in Galt itself, Canada Bread uses the railroad by hauling goods across the small parking area by the team track. Not only the reach in issues you mentioned, but things like curve radius become genuine problems in larger scales. A design requiring multiple turn back curves might be feasible in HO or N, but the same design in O becomes a real headache where curve radius is measured in feet instead of inches. This is why design solutions need to take scale in consideration. Trying to fit a large into a small scale design only leads to frustration and failure. Good point, although it’s always more fun to increase the traffic levels on our layouts, right? Peter Bowers’ book notes in early days the spur with the cattle dock and coal shed on it used to run further to serve a cement plant. Peter notes trains “served the cement mill, lumber mills and later a sugar beet plant”, while Ian’s book notes the coal shed spur extended to a sugar beet processing plant at one time. Putting it all together, I interpret this to mean the sugar beet operation took over the area formerly occupied by the cement mill (or adjacent to it). This could be interpreted as up to 10 cars from Wiarton – or up to 10 cars (including those from Wiarton), since #174 originated in Owen Sound. Always an interesting operation, especially the meets at Park Head. At the recent Train Show here in Kingston someone was running a video of a meet between the mixed and the Palmerston bound passenger run showing the exchange of reefers and baggage cars. Park Head also had a very interesting station…a downed baggage car. If I’m not mistaken, I think there was a furniture factory that used one of the stations between Park Head and Wiarton for shipping their product. Books are still in boxes so I can’t check. This is a very interesting idea, posting these achievable layouts. There are others. Penatang comes to mind. It too has a long spur that serves more than one industry. A very interesting junction would be Irondale on the Haliburton sub. The 1949 timetable had three mixed trains running through this Jct. and exchanging cars in Kinmount and then turning around and heading back where they came from. Trains were based in Haliburton, Lindsay and Bancroft. Very scenic, too, given the bridges very close to the Junction. Westport as well has possibilities given it was served by two daily mixed trains one from Napanee and the other from Brockville. As you say, Galt is also a great choice. I like this spiral idea especially. Might be a way to get Gananoque’s dock area modeled as well. The problem with Parkhead is that there’s a wye, and all three legs must be active to accurately model the operation. That’s difficult to do in S, as you know – it’ll eat up space like nobody’s business. The other shortcoming with Parkhead is there’s really not a lot of switching to do there. A couple of passenger car exchanges and that’s about it. So, for the amount of space it takes up, there’s not a lot of operating bang for one’s buck. Certainly not as much as one finds in Wiarton itself. Junctions are tricky – they’re either so small that there’s not much happening beyond watching the trains roll by (like Inglewood, Ontario), or there’s so big (eg: Palmerston) that they’re tough to shoehorn into our layout spaces – especially in larger scales like S and O. Now, Penetang(uishene) – there’s a great candidate for an achievable layout. Ian Wilson‘s two books on Allendale cover it, including a track arrangement. I count 12 switches, although his plan does not show a run-around track. I’m guessing that the long spur adjacent to the turntable was either double-ended or had a crossover near the station. If not, that’s where I’d add one. It’s definitely in my file of Things To Write About. I just came across your post. My name is Gary and I live just north of Wiarton. I’m in the process of doing research on the Wiarton – Parkhead line with the hopes of modelling it in HO. I have visited the Library and Town Hall in Wiarton gaining some info but not enough to plan the layout. I see that you have mentioned several books that may document the line but am wondering if you, perhaps, would have any other info available. 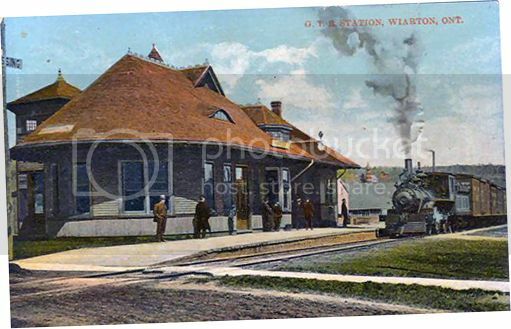 I am hoping to get the Town of South Bruce and Bruce County involved with financing and to possibly display the finished layout in the 1904 Wiarton Railway Station – which is now a visitor centre for the area. The books I mentioned are the only ones I’ve run into. That doesn’t mean it’s an exhaustive list – just what I have to hand.